The Defense Department released the below information and the above photo. 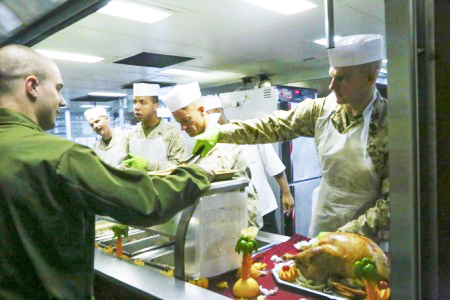 Officers and staff noncommissioned officers with the 11th Marine Expeditionary Unit, and amphibious assault ship USS Makin Island, serve food to Marines and sailors aboard the Makin Island on Thanksgiving Day, Nov. 27, 2014. The Makin Island Amphibious Ready Group and the embarked 11th MEU are deployed in support of maritime security operations and theater security cooperation efforts in the U.S. 5th Fleet area of responsibility.